Last Friday, the Physics Central team met up at the local Six Flags theme park for a sunny day of thrills. We weren't just there for fun, however; a flood of high school students converged there as well for a day of roller coaster physics lessons. We came armed with accelerometers to measure g-forces on four of the park's rides and coasters. Additionally, we sprinkled physics demos throughout much of the park such as a bucket of oobleck, an egg drop contest, and a bed of nails. We have photos and acceleration data from our day at Six Flags America. Take a look below for our recap of Six Flags Physics Day 2013! 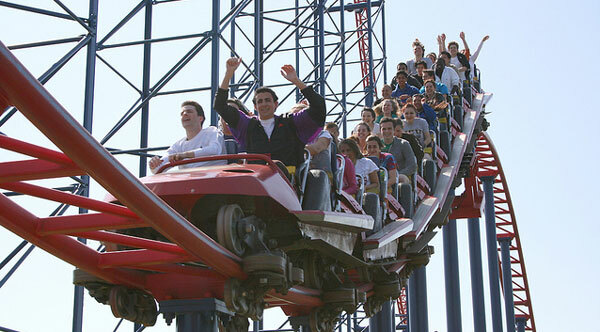 High schoolers ride the Superman roller coaster at Six Flags America on April 26, 2013. The steel behemoth known as Superman: Ride of Steel launches riders to 75 MPH speeds and heights exceeding 20 stories. I rode it last year, and I can assure you it's definitely a rush. Below you can see the altitude and resultant g-force data for the Superman ride. The altitude wasn't calibrated, so the exact numbers aren't correct, but you can still see what matters: the relative changes in altitude. One "g" is the approximate acceleration due to gravity at sea level on earth: roughly 9.81 meters per second squared. While riding the bumps, corkscrews, and loops of roller coasters, students felt accelerations nearly four times as high as the acceleration felt when standing on solid ground. That'll definitely churn a weak stomach (an unfortunate experience I wouldn't wish on my worst enemy. I'm going to stick to the nice, safe train ride next year). Top: The total (resultant) g-force for the Superman ride. Bottom: The relative altitude for the ride (ground level is approximately -140 meters on the graph). Click to enlarge. As the students slowly climb at the beginning of the ride, the total acceleration is about 1 g — the same acceleration felt when standing on the surface of the Earth. While the center of the Earth is constantly pulling us inward, the Earth's surface (or the bottom of a roller coaster cart) pushes back on our feet with the same force, keeping us in place. When there's nothing under our feet, we experience free fall. That's exactly what happens during the first descent of the ride. As you can see, there's a point after the first altitude drop where the resultant g-force drops to almost zero (right around 83-84 seconds). This is when the riders are in the middle of the first big drop and reach a constant downward velocity. Although this is an approximate free fall, the only force acting on an object in a true free fall is gravity. This same effect happens on the International Space Station; astronauts are constantly "falling" toward the surface of the Earth. Due to this constant free fall, astronauts experience weightlessness — essentially the same sensation felt during the middle of a big drop on a thrill ride. Right after that first drop, the ride swoops upward. At the bottom of the drop, the riders experience high g-forces that slow their downward velocity. Some of the other g-forces seen in the graph above are due to the winding nature of the ride in the x- and z-axes. Other rides, however, gave us a more straightforward picture of the physics involved. Doom at Six Flags America. 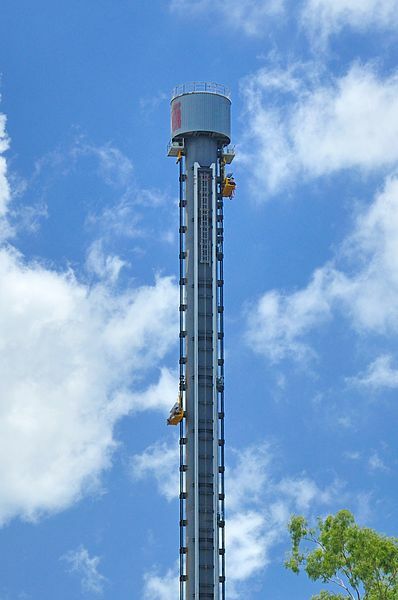 I was stationed at the Tower of Doom — a ride that slowly lifts you 140 feet up, lets your feet dangle for a frightening second, and drops you rapidly back toward the ground. Because the ride only moves along one axis, the accelerometer data clearly demonstrate a few physics principles. This ride likely provided one of the best physics lessons for the students. In the graphs below, you can see how the students inched higher and higher with a constant 1 g-force, just like at the beginning of the Superman ride. Here, we've plotted only the y-acceleration. Because the ride only moves in the y-direction, however, the resultant acceleration is essentially the same as the y-acceleration. Top: Altitude for the Tower of Doom. Bottom: Y-acceleration for the Tower of Doom. Click to enlarge. As shown in the data, the students experienced a solid two seconds of free fall during the drop from the top. You can see this around the 59 second mark where the acceleration drops to zero. Brakes on the ride provided a strong upward acceleration, slowing the ride down and spiking the experienced g-force before stopping again at the bottom. We had a great time spreading some physics knowledge at Six Flags, and we'll be there again next year for more thrills. Six Flags Physics Day is organized by several Physics organizations including the American Physical Society (the publisher of Physics Central), the American Association of Physics Teachers, the American Institute of Physics, and the Society of Physics Students. Of course, Six Flags America provides the rides and assistance to make this day possible. Physics Central would like to thank all of the great volunteers who made it happen this year. I would like to know more about how the data is collected. The amusement industry has a standard for collecting accelerometer data, ASTM F2137-11. For perfectly valid scientific reasons, that standard specifies that the accelerometer be affixed (effectively) to the seat back. A glance at the data presented here suggests that the accelerometer was attached to a rider; in any case, the data looks to me like it reflects what a rider experiences on these two rides. It would be interesting to compare this data to data collected according to the F2137 method. In particular, I notice that the coaster acceleration never quite reaches 0gz, when I know from experience that it should go slightly negative. Likewise, the drop tower data shows a below-zero spike as the gondola is released, consistent with what riders experience, but contrary to the mechanics of the ride. I'm not sure about America but here in Australia, or in Queensland at least, there are vests available if requested and you may put a device (such as an accelerometer application on a phone) in a pocket in the vest and the data can be recorded this way. I'm also curious what equipment was used. The graphs remind me of Data Studio, so I'm guessing Pasco's remote probeware? We were using Pasco accelerometers that were placed inside a vest that the students were wearing. There's a pouch for the accelerometers on the front of the vest. We used Data Studio to collect the data and printed out the graphs for the students. My high school physics teacher was one of the driving forces behind physics day at our local Six Flags resort back in the day (the day being sometime in February of 1984). We didn't have accelerometers or anything like that, but we still had a blast and learned a thing or two about taking measurements in the field. Awesome event. Commercial amusement parks with similar rides do a complete set of measurements as described in the ASTM (American Society for Testing and Materials) document F2137-04 - Standard Practice for Measuring the Dynamic Characteristics of Amusement Rides and Devices. Students seeing the use of these measurements as good practice for the commercial providers of such amusements is an excellent way to make physics real. Anonymous, your code book is out of date; F2137-11 is out. Not that it has changed much. But you are correct. Now if we could just get the physics teachers and the industry to agree on a common coordinate system...!